I woke up like that today. Just exhausted. Just ready to take the bull by the horns and take CONTROL of the noise that seems to float around me all day long. I say that in the sense that I have SO MANY THINGS going on that its hard to focus sometimes. When I started my business I took on anything and everything that sounded like a good fit – I spread myself thin quickly. The better I got at my craft, the more opportunities came my way and the more I said YES. I thought that growth for a business happened just like growth happened for plants – one flower, two flower, three flowers – we’re growing!! Then add other priorities into that mix (family, baby, friends, self, God, etc) and what are you left with? Easily a jumbled mess. I haven’t made it to the jumbled mess stage yet, but before I did… I knew that there were changes to be made. NOs to be said – though they may be painful. I decided a few weeks ago it was time to prune – like you would a plant (oh wait, we DO grow like plants?) cutting back the extra to allow room for the rest to grow, grow, grow in the purest, best, most authentic ways possible – the things that meant the most to you. Life is too short to be spread thin. This feeling started a LONG time ago. And looking back, it’s actually a very powerful, resolved, peaceful feeling. It’s a fierce dedication to what matters most. Last week I was so conflicted over a few big, big, BIG business decisions that I had to sit down and write an actual pros and cons list. On one side I wrote down all the cons of this big decision… there were about ten cons for if I went this route. And on the pros side, I wrote on… MORE TIME, MORE FOCUS. That pro might have well taken up twenty lines. And so the decision was made – after wavering back and forth, shedding a few tears and really struggling with it… it’s done. I feel so at peace with it. And so excited for the direction it is headed, even without me. I decided to leave the Stationery Academy. 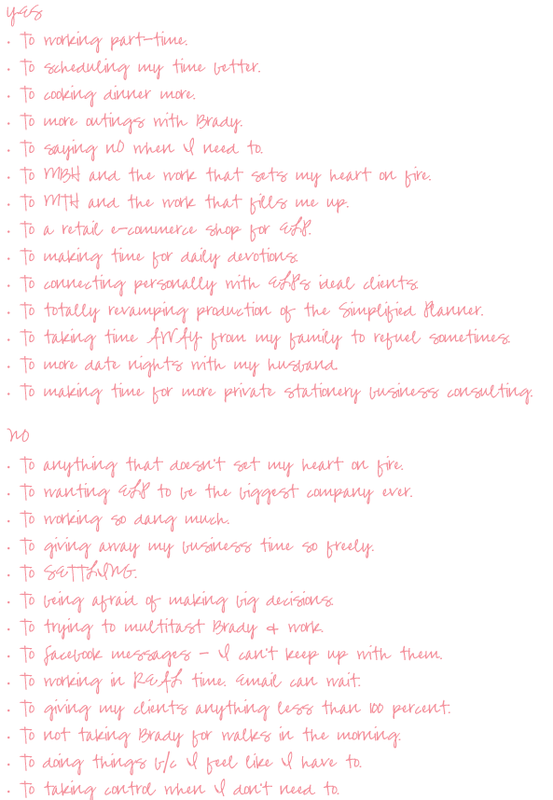 I will always and forever love what the Stationery Academy is about and LOVE the girls who are at the helm, but I just couldn’t give it the love and attention it deserved. This year’s Stationery Academy is going to be WONDERFUL and I highly recommend it. Last year’s class is so close and so supportive. It’s a joy to know each of them. This will allow me more time to continue offering private stationery business consulting as well as focus more attention on MBH and the new Emily Ley Paper Shop. How did I come to this conclusion? Well, another list. I’m a list maker. 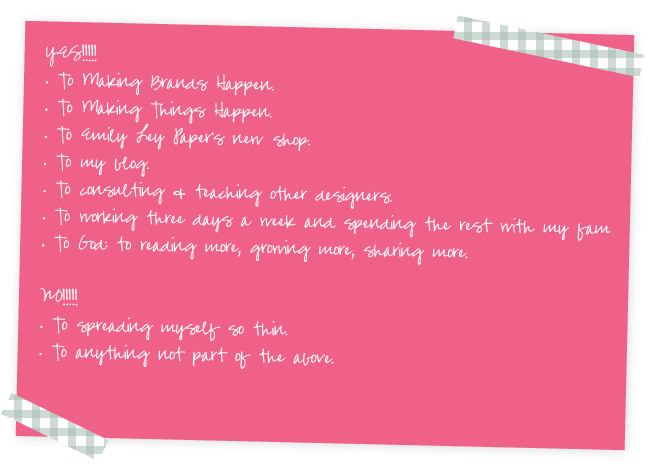 One of my favorite parts of Making Things Happen is our YES/NO list. After doing a lot of deep digging exercises and coming to some pretty big conclusions, we do what might seem so simple and easy – we write YES/NO lists. And that’s what I did last week. I took this giant list and whittled it down into something manageable. Something I could base these big decisions on. And here it is. I love the concept of the YES/NO list. I’m just going to keep coming back to it every time I get overwhelmed. When all else fails, try one of these. Or heck, before everything fails, try one of these : ) Make decisions, stand firm and move forward. Something my dad used to say to me that stuck with me. All that being said, I am SO EXCITED about what lies ahead. We’ve made enormous progress with the Simplified Planner – and the next release will knock your socks off. I say WE because I’ve hired an AMAZING (!!!) Assistant Creative Director. More about her soon with a proper introduction. And the ELP shop…. it’s been a long time coming and is going to be GORGEOUS : ) Fully based on the Simplified Collection. Something that I learned throughout this entire decision making experience… is that sometimes in order to grow, you have to cut back. 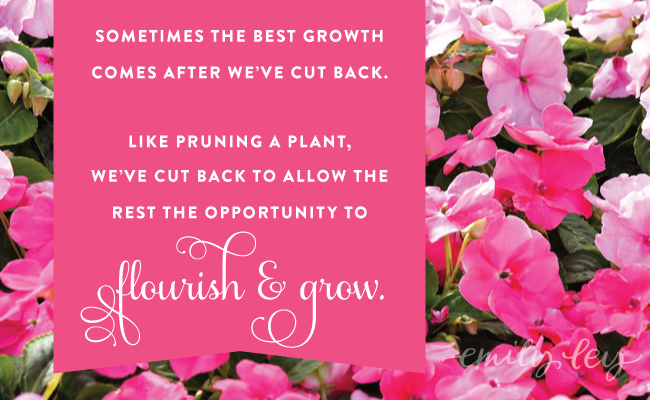 Sounds silly, but its like pruning plants – cutting back to allow room for pure, good growth.